Wrap for a Cause will partner with Nomad Wraps and Demented Graphics to create a memorable, viral billboard campaign to raise awareness for the Lutz Live to Tell Foundation and promote greater veteran and first-responder support. Janine Lutz’s son Janos V. Lutz was a Lance Corporal in the U.S. Marines, serving in both Afghanistan and Iraq. In January 2013, a combination of PTSD and over-medication led him to take his own life. In March 2014, Janine started a support system for veterans called Lutz Buddy Up. The idea is to connect veterans locally to build a network of peers who form life-long bonds through support and community engagement to develop overall well-being. What began as a small group of four veterans has grown in to count 500 veterans among its membership in the Broward, Florida chapter alone. 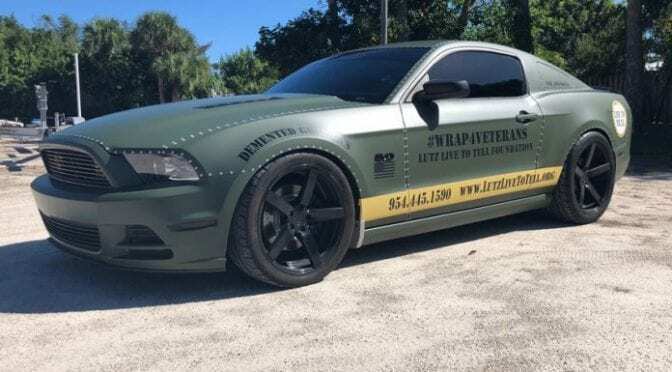 Together, Wrap for a Cause and Nomad Wraps and Demented Graphics will wrap and debut the Lutz Live to Tell Foundation Ford Mustang GT at the renown Cars and Coffee Palm Beach motor vehicle show on November 11. The car will then participate at the fifth annual Patriot Run on November 17th, starting in West Palm Beach and ending in Key Largo. The Mustang will be wrapped in Matte Military Green and will sport the Lutz Live to Tell Foundation logo and the hashtag #Wrap4Veterans. The wrap is being donated by Nomad Wraps and Demented Graphics, and area businesses are invited to sponsor the Lutz Live to Tell Foundation wrap so the three partners can keep promoting this important cause throughout the holiday season. To become a sponsor, please call 1-888-392-9729.